This article is a step by step breakdown on how you can enable Email login for returning customers to your company. Go to https://www.google.com/recaptcha/intro/ and click on the blue “Get reCAPTCHA” button on the top right of the page highlighted in orange in the picture below. Next, sign in with your Gmail account. This account will be the account that handles the Google CAPTCHA. your-company-name.caagcrm.com in the case of your server is located in America. your-company-name.hqrentals.eu if your server is located in Europe. your-company-name.hqrentals.asia if your server is located in Asia. Next, accept the reCAPTCHA terms of service and click on the blue “Register” button highlighted in orange in the picture below. After you have successfully registered your CAPTCHA, you will need to take note of the two keys. They are Site key and Secret key, highlighted in orange in the picture below. In the HQ system, navigate to the Settings highlighted in dark blue in the picture below. In the “Integrations” section, key in the two keys that we retrieved in Step 3. 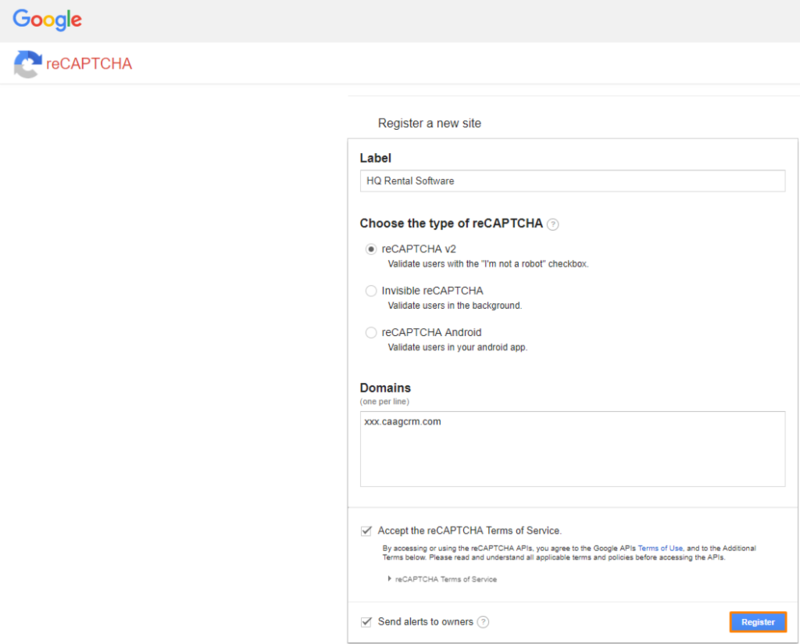 Site key is under Tenant Google Captcha API public key and Secret key under Tenant Google Captcha API private key highlighted in orange in the picture below. Click on the blue “Save” button once you have finished. Navigate to Settings > Items > Integrations in the HQ System highlighted in dark blue in the picture below. Next, click on the blue “Add Integration” button highlighted in orange. Once you have clicked on the blue “Add Integration” button, a new page will appear. Here, select “Social Networks” as the provider type and “Email” as the provider. Make sure that the radio button is “Yes” under the “Active?” label. Once you have finished, click on the blue “Save” button highlighted in orange in the picture below to save the changes. For your customers to receive their username and password, head to Settings > Car Rental > Emails > Confirmation. Here, in your email confirmation template add in these two variables however you will like it to look. To learn how to enable other social logins, click on this link here.